My guest is Dr. Kristen Gallerneaux, Curator of Communications and Information Technology at The Henry Ford. Kristen is responsible for the development of collections and experiences relating to computing, sound, broadcast, graphic communication, office equipment, photography and motion images, and other such areas related to technology. She is also an artist, with her media being sound. 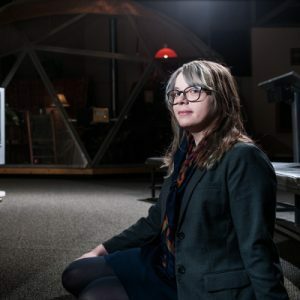 She recently released a new book from MIT Press titled High Static, Dead Lines: Sonic Spectres and the Object Hereafter, which is a literary mix tape exploring boundaries in sound, culture, and belief. [3:28] What can people expect when they visit The Henry Ford? You’ll see airplanes hanging from the ceiling and some of the oldest steam engines in the world. We also have small-scale things that affect people’s lives like computers and phones. We have a lot of things that people won’t expect to see, like agricultural equipment. Henry Ford founded this place as the Edison Institute as a tribute to his friend Thomas Edison and innovation remains a central theme of everything we do and display. [6:08] What is your role? I’m the curator of communications and information technology. I take care of computing collections and the backend process to things we use everyday. I also manage early print and broadcasting technology. I also manage collections from certain innovators like Thomas Edison, Steve Wozniak, and Buckminster Fuller. I’m interested in the minor players and the large historical players. [8:10] What is one of your favorite Thomas Edison inventions? One of my favorites is the electric pen, which Edison started working on in 1875. It was a motorized pen that operated like a stencil. It eventually lead to the mimeograph and the history of electric tattoo needles. The technology that was used in that pen hasn’t changed much — it’s a very modern way of looking at historic innovation. [10:50] What is one trait that you think helped Edison become a successful innovator? One trait that applies to a lot of successful innovators is learning from failure. Whenever Edison thought he had reached the end of a project, he pushed it just a little farther. When he was trying to find the filament for the light bulb, he tried so many things before finally figuring out what the right material would be. It was essentially rapid prototyping. [15:03] Tell us about your experience studying Steve Wozniak. The Henry Ford has one of the few remaining Apple 1 computers and I was able to study its circuits and learn how to program Basic on it. Wozniak is also known as a bit of a prankster, which is a good reminder that you can be a groundbreaking innovator but also have fun, too. Many people don’t know that the first business Steve Wozniak and Steve Jobs built together was a phone hacking company that allowed people to make free long distance phone calls by emitting tones over the phone lines. We have one of those “blue box” devices at The Henry Ford. [20:06] How are these innovators similar? They all share a tireless work ethic, which is pretty common among innovators. You can also see similarities in the work environments between Menlo Park (Edison’s lab) and Silicon Valley in the 1970s. However, Edison was very much a businessman and was very protective of his patents. Steve Wozniak wanted to provide circuit diagrams as open-source knowledge. He hadn’t thought to sell them until Steve Jobs got involved.